For organisations wishing to achieve strategic goals through the use of teams, Purposeful Teams™ is a quick and powerful intervention that awakens effective team performance. Unlike other team development programmes, the Purposeful Teams™ intervention places the team within the organisational context, leveraging organisational mandates into team purpose and creating the space for the team to contextualise its reason for existence. Team members engage at the levels of the organisation, the team and the individual in order to make sense of the task and the relationship issues inherent in teamwork and to translate the team’s purpose into excellent execution. Purposeful Teams™ begins with a powerful and participative two-day intervention in which the team’s challenges, dynamics and dysfunctions are contextually addressed and strategy, actions and roles are clarified, effectively activating and energising team members towards the fulfilment of their purpose. Two half-day sessions follow at monthly intervals to ensure sustainability and empower the team to self-correct and stay on track. Teams report a fundamental shift in engagement, clarity and communication as well as renewed commitment and cohesion. The Purposeful Teams™ interventions fuses organisational development and traditional training in a workshop format. It delivers team effectiveness by supporting the team in anchoring its purpose, identifying milestones as well as integrating task, relationship and process in a conversation-based process that creates strong, committed teams and team members. • Individual (What is my purpose in this team?). The Purposeful Teams™ intervention works with the team’s reality in the realms of Head (knowing), Heart (being) and Hands (doing). Contemporary team members are smart, educated, independent and capable of making a contribution to organisational success - that is why they were hired in the first place. They are quite capable of achieving brilliant results if they have enough clarity on what they need to achieve together and what they can expect from each other along the way. The intervention assumes that the organisation has hired the right people for the work and sets out to align team members behind a clear sense of team purpose. In this way, teamwork becomes a desirable form of work for individuals in the organisation. Team actions are made more appropriate, relationship issues are dealt with more intelligently and team results are delivered more rapidly than what they might have been achieved with any other programme. To support alignment and clarity, an organisational sponsor engages with the team around its organisational mandate and the links to purpose, vision and values. Team members connect powerfully to the organisational mandate, as validated by the sponsor and locate their team in the broader stakeholder context. Individuals connect personally with the work of the team. Team members challenge themselves and their current state as a team. Team behaviours are identified that are helping or hindering the achievement of the team mandates, individual styles are explored and their impact and form powerful commitments to new ways of working. Individuals commit to the team’s purpose in practical terms creating a vision for the future and articulating the team’s strategic anchors. Building on vision and strategy, team members commit to milestones and actions required. Individual contributions are valued and individual development commitments are clarified. The team returns to the workplace to implement these commitments. After a period of implementation, the team returns to review progress against strategy and commitments and reflect on team learning. Team members recognise changes that need to be made and they re-energise and refocus around the team purpose. In the second follow-up day, the focus is on sustainability of purpose and performance. Team members reflect on team development, celebrate successes and identify their next frontier as a team. They plan to sustain their effectiveness and engagement into the future. Being a member of a team becomes a desirable work-form in the organisation. Members of purposeful teams are high-performing and effective and they deliver rapid results for the organisation. Members of purposeful teams implement appropriate execution strategies and action plans to deliver strategic objectives. The Purposeful Teams™ intervention addresses potentially derailing team processes and relationship issues. Team members embrace alignment to purpose as a driver of performance (alignment with vision, values and strategic intent). Team members renew their focus on important organisational objectives and achieve clarity of purpose. Team members identify and work towards key milestones to achieve their purpose. Team members integrate task, relationship and process for high performance. Team members engage in meaningful conversations and create action plans to accelerate their effectiveness. Individual and team commitments are formed and put into action. Creative dialogue: For full engagement of all participants, we draw on an old African dialogue technique called Lekgotla (creative dialogue) to ensure that all voices are heard. The Lekgotla process assists individuals to be heard in teams, groups to build a common point of view and become teams, and teams to pursue common goals. Diversity is celebrated and built on as teams learn to listen carefully, synthesise multiple viewpoints, build on the thinking of others and to move away from the often-instinctive practice of ‘the loudest voice wins’. The Purposeful Teams™ intervention provides the space for team members to grow themselves and to grow their team. This growth is achieved through consistent documentation of the work required and regular review of personal and team commitment plans to ensure that team members are leading themselves to growth in order to lead the team towards its purpose. Individual styles assessment: The Purposeful Teams™ intervention utilizes self-assessment of individual styles and their impact on teams to support individuals in understanding how they contribute to team success and manage their impact to give the greatest possible benefit to their team. Learn from each other and from the challenges of taking action. Reflect on their ability to diagnose and work to resolve team challenges. Celebrate their progress and determine next steps. With key time and performance requirements, project teams must engage rapidly in effective execution, problem-solving and team learning. Upfront alignment reaps benefits when project challenges and conflicts must be resolved. Teams engage intensely on purpose, priorities and teamwork to accelerate Forming and Storming, moving from “why are we here?” to traction and learning. Teams focus on mandates and stakeholders (requirements, outputs and customers) as well as interpersonal, team and individual needs. Project sponsorship is actively engaged, creating a strong sponsor-team relationship. While Purposeful Teams™ does not deliver a detailed project plan, team members align on key priorities and milestones, building a foundation for project planning. A structured process is used to review team progress, building team skills to learn from derailing events, re-plan and re-commit as a team. Virtual teams allow individuals to collaborate on a common purpose, through technology, despite being geographically distant. The intervention may be implemented virtually, utilising that team’s existing technology solutions and improving effectiveness and connection. Team members build trust and relationships through deep engagement during the intervention and commit to how they will relate and continue building trust in the future. The team focuses on team habits relating to decision-making, accountability and commitment. By building alignment and improving their ways of working, team members achieve improvements in their processes and effectiveness. Effective executive teams provide strategic and operational leadership that influences the entire organisation. The challenge is to shift from a group of independent executives to a cohesive, interdependent team. Team members build powerful alignment on shared strategic priorities that cross functional boundaries, breaking down silos at executive level and supporting collaboration in the broader organisation. Team members identify personal styles which enable the team to leverage unique individual contributions. Each team member gains an understanding of his or her personal style, its positive impact and risks. Understanding and commitment to purpose allows executives to ask and answer the questions: What is most critical for us to achieve our purpose? How is this going to help us achieve our purpose? Wherecan we best invest our energy and resources? Matrix teams offer the potential to harness complexity and break down silos, focusing teams on multiple business areas and priorities. However, this complexity is also their greatest challenge. The intervention creates a space for a paradigm shift in stakeholder management, leveraging multiple inputs and addressing sources of stress or conflict. Team members focus on a clear shared purpose and team and individual contributions, creating a foundation for flexibility, alignment and shared leadership. The intervention begins and ends with organisational integration that entrenches the ‘guiding lights’ of alignment to vision and purpose. Matrix team members gain a deep understanding of their challenges and opportunities and how they fit into the larger system. While the stages of team development cannot be bypassed, the team will be empowered to navigate the early phases, accelerating development by driving courageous conversations on critical issues. The sponsor plays a powerful role for a newly-formed team, offering an external feedback mechanism. The team’s mandate and strategy are shared with key stakeholders to drive powerful alignment from the earliest phases. Nine Conversations in Leadership™ is an innovative leadership development intervention that acts as a catalyst for long-term development of leaders. The intervention is applicable at every level of the organisation and utilises a process that adapts to the organisation’s context. The intervention consists of nine facilitated conversations that occur within a small peer group (comprising up to ten people), referred to as a leadership cell. The purpose of each conversation is to share and learn from one another’s leadership challenges and successes and to co-create ideas and solutions from shared learning and wisdom. The Nine Conversations in Leadership™ intervention fuses organisational development and traditional training in a workshop format. It uses 360° feedback, peer coaching and personal development planning to create strong, committed and aligned leaders at all levels of the organisation. The intervention examines leadership in the realms of Head (Knowing), Heart (Being) and Hands (Doing). It brings participants together repeatedly to explore and cover all aspects of leadership, from organisational leadership to team leadership, and the leadership of individuals and self. Conventional programmes that address the theory and practice of leadership make the mistake of isolating delegates from the environment for which they are responsible, equipping them with theory that may not be relevant for their workplace, and often broadening the leadership divide rather than narrowing it. This frequently leads to disillusionment – in the delegate and in the people that he or she leads – causing disruption, misalignment and, in the worst-case scenario, the loss of skills. The Nine Conversations in Leadership™ intervention utilises a process that adapts to the organisation’s context and that of the participating leadership cell members. Leaders within the organisation participate collectively in this powerful leadership journey, narrowing the leadership divide and uniting organisational leadership. 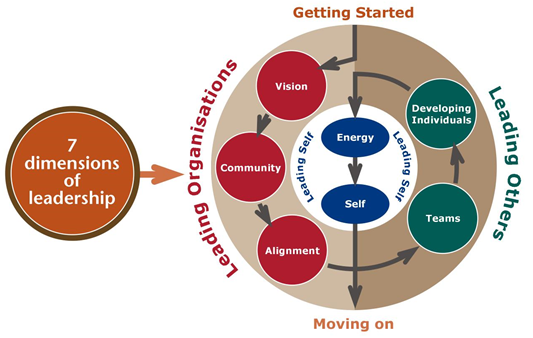 This process creates both personal leadership development and organisational leadership alignment, which significantly enhances the organisation’s ability to drive change. Solidifies organisational leadership around the organisation’s vision, values, purpose and strategy, building trust and alignment in leadership teams. Aligns the organisation, supporting clarity of leadership messages throughout the organisation. Enhances the organisation’s ability to respond quickly and uniformly to strategic shifts and contributes to enhanced financial performance over time. Supports talent identification and management of the leadership pipeline. Increases team cohesion and leadership capability at all levels through the development of leadership skills. Identifies opportunities for enhanced organisational effectiveness as the vision, strategy, team dynamics and essential operating elements are examined continually in an open and structured environment. Grows the self-awareness, leadership competencies and personal effectiveness of leaders in the organisation. Builds knowledge of the elements of leadership. Prompts values-based reflection on the elements of leadership. Encourages behavioural changes to improve performance. Deals with the challenge of crafting an inspiring vision and strategy for the organisation. Leaders choose to create and communicate a vision that is shared by the community, and gives meaning to the work performed. Deals with alignment as a critical component for harnessing the community’s resources in achievement of the organisation’s vision, and is central to leadership and organisational performance. Leaders choose to make their community’s work meaningful by aligning individual efforts using both intangible methods of influence and tangible, structured alignment mechanisms. Explores the importance of teams for organisational and individual growth and success. Leaders are involved in building teams, leading teams and participating in teams. Leaders choose to take a role in team evolution, empowering teams and helping them to develop. Deals with one-on-one developmental relationships in which a leader focuses on developing the competencies and supporting the growth of another person. The ability to develop individuals is critical to personal and organisational success, and is a key element of the leader’s role. Leaders consciously choose to become developers of individuals. Explores current thinking around wellness and energy as the fuels for performance. Leaders choose to take responsibility for their energy and its impact on the quality of their organisational and personal lives. Synthesise the learning from the Nine Conversations in Leadership™ journey. Celebrate the journey and consider next steps. Leaders choose in what way to continue on this leadership journey and next steps to develop other leaders. Creative dialogue: For full engagement of all participants, we draw on an old African dialogue technique called Lekgotla (creative dialogue) to ensure that all voices are heard. The Lekgotla process assists individuals to be heard in groups, groups to build a common point of view and become teams, and teams to pursue common goals. Diversity is celebrated and built on as individuals practise the art of listening and building on each other’s views in a facilitated environment that balances concept exploration and learning with efficient utilisation of time. Through the use of the Lekgotla process, developing leaders learn to listen vigilantly, to synthesise multiple viewpoints, to build on the thinking of others, to work with multiple minds instead of relying on ‘solo command’ and to move away from the often-instinctive practice of ‘the loudest voice wins’. Personal development plans: The Nine Conversations in Leadership™ intervention provides an enabling environment for leaders to grow themselves and their organisations. This growth is achieved through consistent documentation of the work required and regular review of personal development plans to ensure that leaders are leading themselves to growth in order to lead the organisation to growth. Assessment mechanisms: The Nine Conversations in Leadership™ intervention utilises self-assessments relating to the leadership dimensions to provide a platform for each individual’s developmental journey. The self-assessments are shared with other members of the leadership cell so that comparison and standardisation can emerge. With the permission of the cell members, the assessments are extended to 360° feedback for each participant at the end of conversation eight in order to provide a reality check against any emerging consensus view on individual strengths and development areas. • See the organisation and topic through other people’s eyes. Action projects: Members of the leadership cell are tasked with specific action projects to implement the information gained during each conversation in the workplace. Participants are asked to identify an issue, challenge or problem in their organisation, to address this and take action on it. The action projects require them to integrate the three realms of Head, Heart and Hands as they work together to address a specific challenge and create an action plan. Intended as a change catalyst for the organisation and a personal development experience, members of the leadership cell are required to identify goals for the action plan and include tangible, realistic implementation steps that will make a positive difference in their organisation. Each participant builds a portfolio of evidence to keep track of the leadership journey and success achieved.